Assembled by each couple, these baskets full of their favorite things are truly one-of-a-kind. JT & Lexi's basket includes: an ASTRO A4OTRX-Edition Gaming headset, POP!Hamesz:Fortnite Cuddle Team Leader Collectible, Fornite Skull Trooper Bitty Bommer Bluetooth speaker, Pocket Pop! 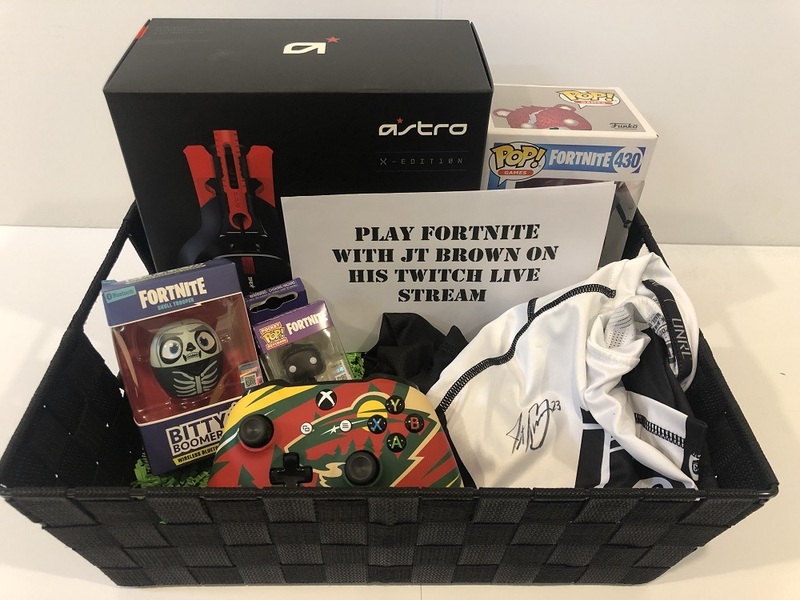 : Fornite Rauen Keychain Collectible, a custom one-of-a-kind Minnesota Wild Xbox One Controller, an autographed UNRL Gaming jersey (size large), and a certificate to Live Stream with JT Brown on his Twitch Account (Fornite). Proceeds benefit Women's Advocates, a local domestic abuse shelter.